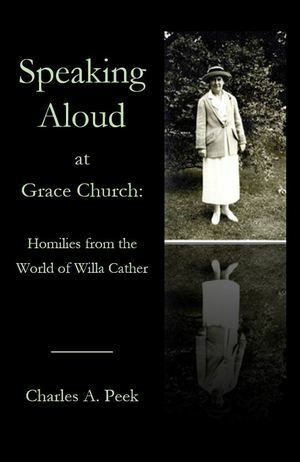 Speaking Aloud at Grace Church was written and compiled by Charles A. Peek, an Episcopal priest and member of the Foundation’s Board of Governors. The book is devoted to homilies that Rev. Peek gave at Grace Church in Red Cloud over the two decades spanning the turn of the 20th to the 21st Century. Most Rev. Frank Griswold, Former Presiding Bishop of the Episcopal Church, notes “With great skill and insight, he brings in to sharp relief aspects of Cather’s personal history and writing which can only deepen and expand our appreciation of what makes her novels and stories timeless in their capacity to reveal truth and the inner working of the human spirit in both its frailty and strength.” Regardless of whether readers have had the pleasure of hearing Rev. Peek preach, this book offers cherished insight and brings about fond memories from many notable events in the Cather community. All copies are signed. By special arrangement with the author, all proceeds will benefit the work of the Willa Cather Foundation.